Shane Krogen, the founder of the nonprofit High Sierra Volunteer Trail Crew, fell out of a helicopter and died on Thursday. He was on a marijuana cleanup trip in the southern Sierra. Shane was a close friend of Dr. Ken, who has been a member and participant here. I'll write more later. I knew Shane - this is a terrible loss. I didn't know Shane, but I wish I had. 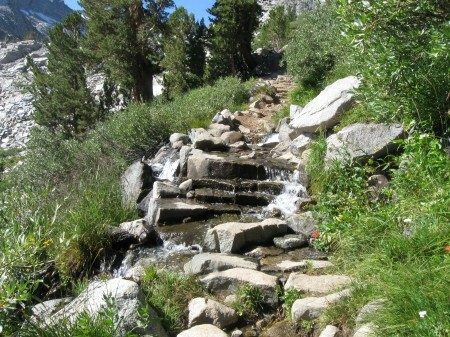 On the JMT last month, I made a point of thanking every trail crew member I passed for his and her work. One of them stunned me with his reply: "thank YOU, for walking". Clearly there is culture and spirit of joy in the work, craft, and in some cases artistry in what these folks do. At one prime example of the latter, I was so moved it actually took me a few minutes, and a concerned inquiry from another hiker (Akichow, as it happens) , to get myself back together and on down the trail. A spot like this ought to be dedicated to a guy like Shane. Shane was truly a remarkable man. He was devoted to making the mountains a better place. He will be missed. He was there for me when I had an accident on a trail crew project. He drove me the many miles to the nearest hospital, waited for me, and bought me dinner after I got out of the ER. Then drove me back to the campsite. Then, he drove home, getting there in the early AM. All of this without any complaint. We got to talk a lot during this time, and I had a chance to learn about the man, Shane. As said before, you have to wonder about life being fair. RIP Shane Krogan. I just saw the story in our local paper today and came here to see if it was posted yet. I had not met Shane, but had hopes of joining one of the trail crews with my family, so I'm saddened to hear of his loss. He left a legacy. "A memorial service will be held in honor of Shane Krogen on Saturday, September 21, at 10:00am. The location will be Woodward Park, 10 E. Audubon, Fresno, California. Just follow the cars to the location within the park. This will be an open air service, all are welcome. Please bring your camp chair." Heather - you might like to announce this at our general meeting on Wed. night. Shane of course was the recipient of a chapter award at our banquet a few years ago and more recently did a presentation for one of our general meetings. For those of you who didn't see this, Marek W. of the Bee wrote a lovely tribute to Shane. ...For those of you who didn't see this, Marek W. of the Bee wrote a lovely tribute to Shane. Marek wrote such a good article. My biggest regret is that I never found the time to join the H.S. Trail Crew on any of their projects.